Central European Austria has issued 50 fines to transgressors of the full face covering ban in the first six months since it was enacted, each carrying a punishment of up to €150. In a sign of how effective the ban has been in changing behaviour and discouraging the garment in public places in the nation, the majority of the 50 fine issued were in the first two months after October 2017 when the ban came into effect. The fines were also predominantly localised to Vienna — Austria’s capital and most cosmopolitan city, with just nine in Lower Austria, and six in Tyrol, reports top Austrian newspaper Kronen Zeitung. The number of fines given out in the early days of the ban were inflated by activists deliberately provoking police with full face coverings, with Ministry spokesman Alexander Marakovits remarking these actions may have been to see whether police would actually enforce the law. 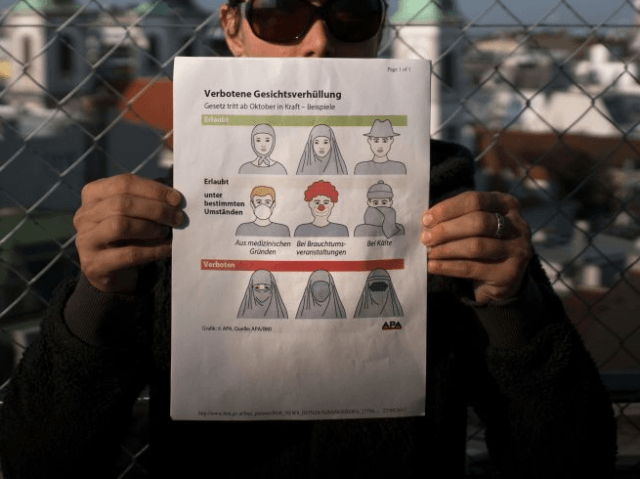 To avoid having to issue fines to visitors to Austria, the nation’s foreign ministry issued guidelines to foreign tourists from countries where full-face veiling for women is common, warning them the practice was not accepted in Austria. The text of the law also allows certain contextual facial coverings, so not to interfere with ordinary Austrian society. While full-face coverings like the burqa and niqab are banned, the hair-covering hijab and ordinary hats are not. Examples of situations where full-face coverings are permitted in the law are medical-masks for work reasons, clown or comedy masks for cultural events, and scarves wrapped around the face in cold weather. Among those protesting the ban was Algerian millionaire and political activist Rachid Nekkaz, who promised to pay the fines of any women who defied the law and went out in public veiled. In France, Belgium, the Netherlands, and Switzerland, he and his organisation “Touche pas à ma constitution” (“Don’t touch my constitution”) have spent over 300,000 euros paying off fines and legal costs for opposing similar laws. Others took matters into their own hands. Breitbart London reported in October as the new rule took effect of one Niqab-wearing woman who attacked a teacher, after being reminded that wearing the garment was now illegal in public in the country. The 17-year old was charged with bodily injury and disobeying the face covering ban. It has also been claimed that some women have decided to move out of Austria rather than comply with the law. Following Austria, Denmark is now considering joining a number of other European nations in considering banning full-face coverings.